Confession time: I have a weird addiction to street food. Given the choice between a fancy shmancy restaurant where scented foam will inevitably be involved, and a greasy, delicious meal from a street cart, I'll be the one standing in line with the drunk club-goers, taxi drivers, and nighttime security guards waiting for hot dogs, tacos, and street noodles. A few years ago when the hubster and I were in New York while I was taking the bar exam, or "the time that shall not be mentioned," I ate the lamb and rice plate from the 53rd and 6th food cart every day. I blame my inability to appreciate fancy food on Pakistan. Yes, I'm now blaming entire countries for my idiosyncrasies. See, when you grow up in a developing country where great street food is sold on every block, it's hard to get swept up in the white linen tablecloth craze. My favorite Pakistani street food? Sweaty man kebabs. Allow me to explain. Growing up, my favorite food came from a bald man with a Charlie Chaplin mustache who used to run a tiny, roadside stand where he stood behind a giant griddle over a propane stove cooking up all kinds of delicious kebabs. The aforementioned man wore a dingy grey, sleeveless undershirt that I'm certain was white eons ago. And he'd go about cooking his kebabs, shouting orders at his minions and serving the ever growing line of customers with ruthless efficiency. And as time passed, he'd grow sweatier and sweatier. Sweat would drop off his bald head, off his forehead, off his nose, and God knows where else, on to the pan. And he'd continue on cooking his kebabs. Delicious kebabs, I might add. Now before you freak out, keep in mind that the dough for naan is traditionally kneaded by a sweaty, hairy man, marching barefoot in a giant vat of dough. And I'm guessing the people dancing around in giant vats of grapes to make wine didn't wash their feet all that thoroughly either. So really, sweaty man kebabs weren't that big a deal. It's been a few years since I've been to Pakistan and I'm told the Sweaty Man has upgraded his roadside stand to an actual restaurant. He now wears an undershirt that is actually white. And frankly, I'm not sure how I feel about this. So, I have to try and replicate the kebabs at home. Truth be told, these taste nothing like sweaty man kebabs. They aren't dripping with grease or served with a side of sweat. But they are delicious and dare I say, almost healthy. 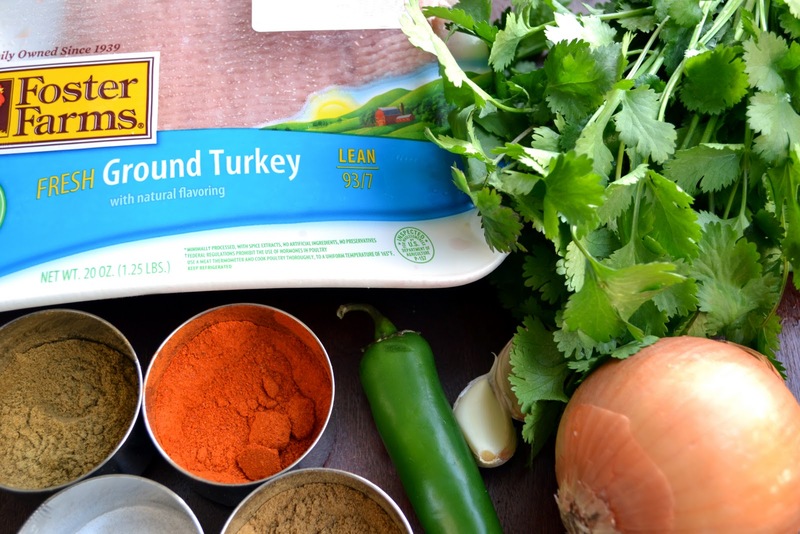 Ground turkey, generally milder than ground beef, really lets the flavor of the spices and herbs shine through. Traditionally made and grilled on skewers or seekhs, the kebabs taste just the same molded in kebab shapes minus the skewers. And if you make a bunch and freeze 'em raw, they grill up perfectly well in a pan for a quick and tasty dinner. All in all, they're kebabs that'd make even the sweatiest man proud. Spray a cookie sheet with nonstick spray. 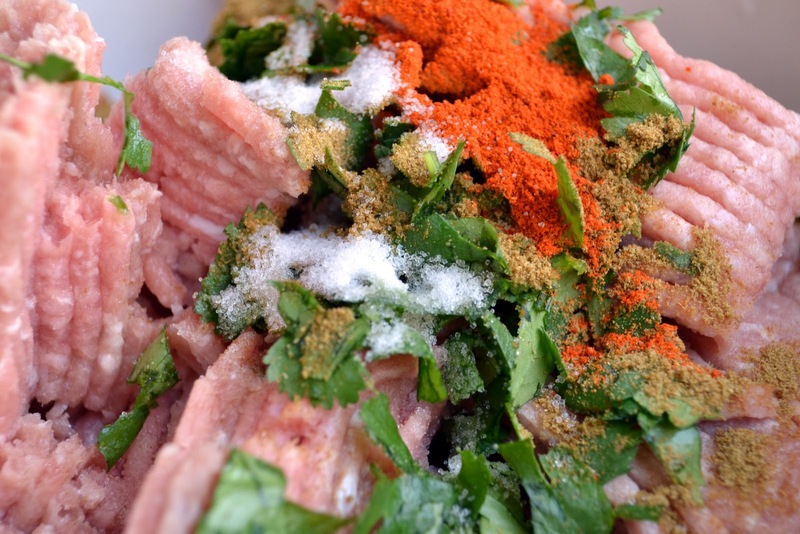 In a bowl, combine aromatics and spices and mix thoroughly into the ground turkey. Take a teaspoon of the mixture and fry it in a pan as a taste test. Adjust spices if necessary. Take 2 tablespoons of the meat mixture and mold it in kebab shapes. If you find the mixture is too moist, add some breadcrumbs to dry it out. Alternatively, if you find the mixture is too dry, add a beaten egg. I've generally found ground turkey has the perfect amount of natural fat and doesn't need breadcrumbs or an egg. Complete rolling the rest of your kebabs and line them on the greased cookie sheet. Pan fry if eating right away or freeze for later use. Once the kebabs are frozen, you can take them off the cookie sheets and freeze them in a Ziploc bag. They keep for months (not that they'll last that long). This looks SO good! I'm a little bit obsessed with seekh kebabs. These look delicious. You always make such delicious looking food. We are planning on going to NYC for our anniversary. I hadn't planned on eating street food, but maybe we should. My favorite street food is Italian sausage and peppers. I bet NYC as some great sausage vendors. I don't have any experience with street side vendors here in the U.S. (they haven't shown up in small-town NC yet), but I do know some of the best food I have had were from those kinds of places in Mexico, Armenia and Lebanon. And, I'm huge into kebabs of any kind (even semi-healthy ones). I have to admit that I prefer mine with out the sweat (that just about made me gag). I love street food, too, and can't wait for the day when more of it comes to Boston :) In the meantime, make your own street food is perfect! Sometimes it's the little bits of "love" that really make a dish. Just as long as I don't quite know exactly what that "love" is of course. These look amazing! I do love street food though I really don't eat much of it here. Our nearest halal cart is a few blocks over...too far to move for street food! I have always been terrified to eat from the roadside stalls in Pakistan and India. After watching my sister collapse from food poisoning, minutes after eating some chicken tikka, I knew that I'd stick to my homecooked food. I do think that Sweaty Man would be proud of your perfect looking kebabs...seriously, they are perfect. oh this is too funny - and I'm with you - if it's good "real food" that is what I want to eat! I love Street Vendors.. esp hot pretzels, roasted chestnuts, and any sweet or savory pan I can get my hands on. Oh my goodness! I'm the same way!!! I get so awkward at restaurants where I'm waited on- give me a street cart any time (and the lamb gyros at 53rd? JEALOUS!). How cool- I make this all the time and pretty much the same exact way you do- its my favorite thing ever! I usually sautee some onions and then warm up a naan on the skillet and dash in some chutnee and make "naan kebobs" - DELISH! I love street food too , i think some of the best food i have ever had is from street stalls. I am sure bookmarking this recipe. I love little spicy bits of grilled ground beef. 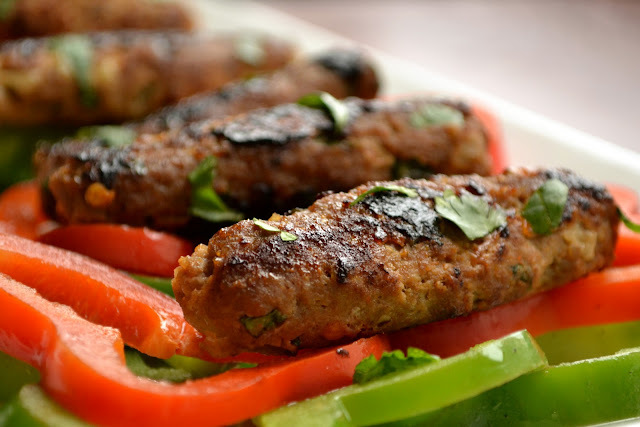 Kefta, kebabs, cevapi, keftedes, or whatever else you want to call 'em... they're all good eats in my books. And how awesome is it that I don't have to wait until grilling season to make these? Love love love. I got totally hooked on the title of this post and proceeded to read, only to confirm what I had suspected you'd be writing about. Just back from India, nothing tasted better than Mumbai's version of sweaty man kebabs at my local street corner kebab-wallah and the dirty-fingernail man paani poori's at my favorite roadside joint. I've had countless conversations with fellow Indians and Pakistanis about how much tastier the food is when it is prepared evidently, not so hygienically :-D The only point of grace is that any germs get undoubtedly annihilated when the kebabs go in the hot coal grills. 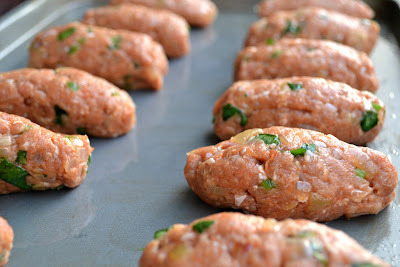 These look great-- my husband is Pakistani and seekh kebabs are his favorite-- I'm going to try making these soon! Loved reading this post!! And love the recipe even more! Well once you explain it like that, the sweat or the dirty feet don't bother me one bit! He He Love seekh kebabs. Like how you fixed them with turkey too. Hope you are having a great week. Another delightful post. Not only do these kebabs look great...but they are accompanied with a great story. Like you, I always prefer street food. I love interacting with the vendors and sampling a variety of fare for only a few bucks. Thank you for sharing yet another delicious recipe. I hope you have a fabulous Friday and a relaxing weekend! I have recently stumbled on your blog.Totally love the food u cook.And i am a self proclaimed street food junkie and living in Pakistan have no shortage of it either:)My most fav street food is the Bun kebab(a karachi specialty). I love street food and the mighty taste of street food can't be beaten by any reataurant. I too have favorite sweaty chaat man from India but have to say once he upgraded to a small take out place the food lost it's magical taste or probably I'm conditioned to thinking otherwise. lol u always make me laugh sweetie. I totally agree the sweatier the tastier...how don't how many of the firang's will totally gross out by reading that statement :) I dare say I use chicken, beef and lamb but never turkey, as u knw the Indian man in my life (namely my hub)thinks turkey is gross. Can u imagine? I'm the same way--I'll take street food over a white tablecloth meal any day. These are definitely healthier than the sweaty man's, I would imagine. These would not last long in my home. HaaHaa, when I read your title on my Google Reader, I thought maybe you mis spelled Sikh. ;) I was like, wow, that's an interesting title. heehee, seekh=skewer, got it, pheewww! I am not comfortable in foo foo resteraunts either and I loath chain resterants. Over priced and over pretentious vs frozen, mass produced junk. We don't have any street vendors here in Phoenix unless you count the 'Roach Coaches' which IMHO have killer tacos and salsa! Great choice in using ground turkey breast, it does let the spices shine! I'm with ya - I'll pick a greasy burger from a food truck over coq a vin with vanilla scented gelee (whatever that would be!) any day! These look killer! Maybe if you wore a dirty shirt and made the kebabs with your feet, they would have come out closer to the original. :) They look really good. Haha I can soo relate. I crave sweaty man food more than anything!! Luckily, I can still go out and get some whenever I want. The kebabs look awesome, printing the recipe out for the cook! I never got to enjoy the street food in India since I wasn't born there and don't possess the stomach with steel lining :) But I did love the cart food of "China Man" on my college campus... unfortunately, it turned out "China Woman" was actually a hub for a secret illegal substances trade. Good thing they weren't associated... Your kabobs look delish! I'm going to try them with soy meat! Looks delicious! Check out my blog verucaspice.com for Indian and Indian-inspired recipes!